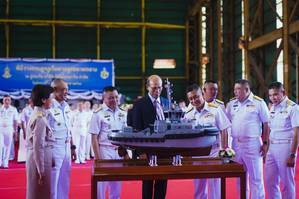 Thai shipbuilder Italthai Marine Limited in July hosted a keel laying ceremony for a new 32-meter tug that it is building for the Royal Thai Navy (RTN). The builder was awarded the construction contract for this second RAmparts 3200 tug earlier this year after delivering the first, Panyi 857, in 2016. Designed by Canadian naval architect and marine engineering firm Robert Allan Ltd., the tugs are built for handling large navy vessels and submarines coming in and out of port, as well as supporting oil recovery operations, firefighting operations and other duties. The hull form and all equipment on board the new vessel will be the same as on Panyi 857, with an enhanced fendering system to handle the navy's new submarines. Similar to Panyi 857, the sister tug will be built to the notation of ? 100A1, Tug, ? LMC, Fire-Fighting Ship 1 with Water Spray System, of Lloyd's Register. In addition to the RAmparts 3200 duo, Italthai has previously built two other Robert Allan Ltd. designed vessels for Thailand. In 2012, the shipyard built a pair of RAmparts 2800 tugs for the Port Authority of Thailand, Tarua 120 and Tarua 302.